What is all the buzz about Dermagist? So I tried it out and here is what I think! I try, but I will probably fight it every step of the way. I'm not ashamed to be fifty, I just don't want to feel or look fifty. I tried the three product kit, precision formulated to attack ALL the signs of aging. 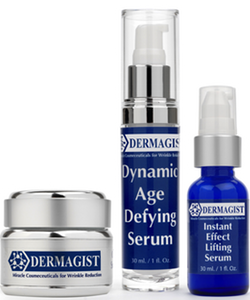 A combo of the finest products that target wrinkles on an instant and long-term basis, plus peptides that aim to shrink enlarged pores, reduce age spots, fade redness, and drastically improve the look of deep wrinkles as well as fine lines. Okay, I didn't have the nerve to bare my whole face, but here is my forehead. This is just two weeks using Dermagist. Notice the redness is gone in my skin. Take a look at the forehead lines between my eyes. Not a huge difference, but after only two weeks I am very impressed. I love this product! When using this I can actually feel my skin tightening. It is much softer and smoother. My pores have significantly tightened up. I am excited to continue using my Dermagist. I will have to post more pictures at a later date. 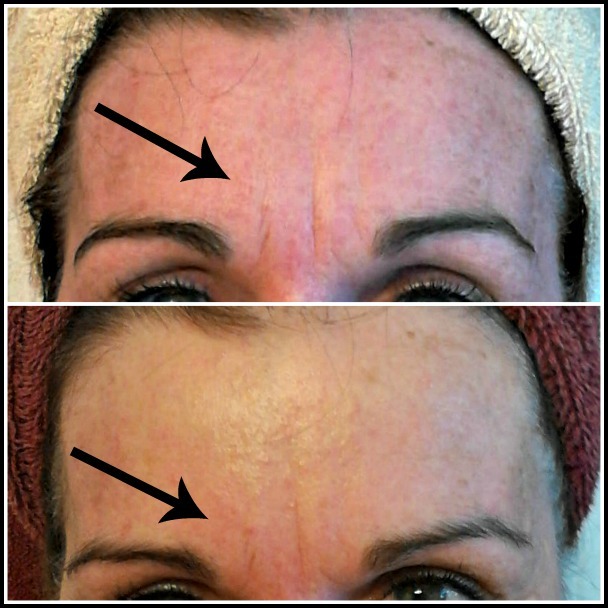 Go visit the Dermagist site to get your own products and to view more pictures of others and their wonderful results.